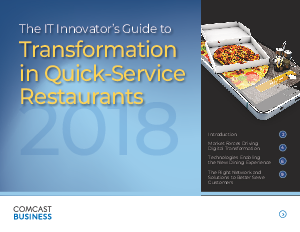 The quick-service restaurant industry continues to be a favorite among consumers who look to the sector for a wide variety of food served quickly and at a low price. The speed and efficiency of QSRs, which include the emergent “fast casual” restaurants, match today’s on-the-go lifestyle of consumers across all ages who often are too busy to cook at home. That said, consumers expect their dining experience at a QSR to be comfortable with conveniences ranging from WiFi connectivity to ordering kiosks and dining area entertainment on large screens or even tableside tablets. They expect the information on menu boards to be accurate and up-to-date and their meal orders to be fulfilled quickly and accurately. Technology is a major enabler in meeting consumers’ expectations while simultaneously helping QSR locations increase operational efficiencies and quality of service.